The Marcy ME-1019R recumbent bike features an almost identical frame construction and design to the XTERRA SB150. However, it is equipped with a mechanical magnetic resistance system, not an automatic brake, and does not have preset programs. In other words, it’s in the same feature range as the Body Champ BRB3558. It’s definitely not an exercise bike for commercial use, but can be a perfect addition to any home gym, for light cardio and conditioning. 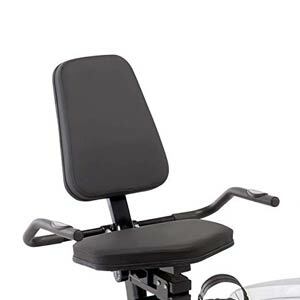 The Marcy ME-1019R features a frame composed of two main pieces, the rear part with the seat, and the front part that holds the drive system. The two pieces connect at the middle. The bike’s frame has a step-through design. This being said, taking position on the seat shouldn’t be a problem even for users with certain disabilities. All the tubes in its structural frame are made of steel. Its construction also includes several ABS parts, such as the seat base covers or the covers of the flywheel and resistance elements. These only have a protective role, though; they don’t reduce the unit’s overall sturdiness. 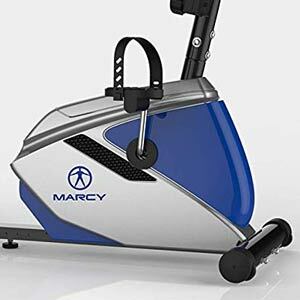 Compared to other fitness machines, this Marcy exercise bike isn’t extremely large. However, it still takes approx. 57″L x 25″W (145 x 63 cm) of floor space when it is fully set up. Plus, it is recommended to leave at least two feet of clearance on each side of it for ease of access and usage. The bike isn’t extremely heavy. It weighs approx. 78 lbs (35.3 kg) which is enough to provide plenty of stability. This being said, it can be assembled by only one person. Also, once the unit is fully assembled, it can be transported with ease via the wheels integrated into its front base. The unit’s rear base is equipped with two polygonal stabilizers. These can be rotated, offering the possibility to stabilize the bike on an irregular floor. There’s also a small stabilizer placed at the middle of the main 2-piece frame bar. The Marcy ME-1019R features a black powder coating finish. The paint is corrosion-resistant, however, the bike is made for indoor use only. If stored or used outside, moisture can eventually corrode other small internal parts, screws or bolts, and damage the console. 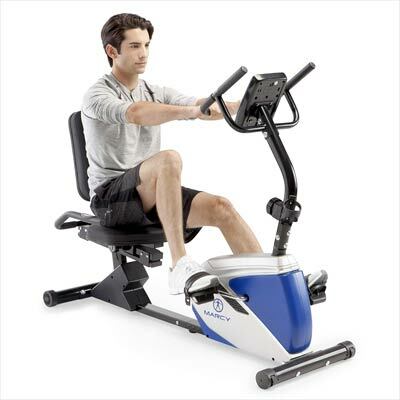 The Marcy ME-1019R recumbent exercise bike features two sets of handlebars. One is attached to the front mast; this handlebar assembly features a multi-grip design, with inner curved grips at the bottom. This handlebar is non-adjustable and does not integrate pulse sensors. The other set of handlebars is attached to the seat frame. These handlebars aren’t adjustable either, but since they are directly attached to the seat, they will move along with it on the adjustment bar. They also have rubberized grips and integrate metallic pulse sensors. The bike is equipped with a fairly standard seat. Its bottom pad and backrest are cushioned, integrating approx. 1.5″ (4 cm) of foam padding. Their upholstery is made of durable and flexible vinyl material. The seat assembly is adjustable. It can slide forward or backward on its rail offering several adjustment positions. This being said, the bike can accommodate users up to 6’2″ (188 cm). Just as the seat handlebars, the backrest cannot adjust independently from the rest of the seat. It does not recline as for other bikes, such as the Fitness Reality X-Class 410. Last but not least, the bike’s seat assembly is rated for a user weight capacity of 250 lbs (113 kg). Several sources mention a user weight capacity of 300 lbs (136 kg) for this bike. However, the manual specifies a user capacity of 250 lbs only. The Marcy ME-1019R integrates a perimeter-weighted, metallic flywheel. Its exact weight is not specified, but considering the overall weight of the unit, it should weigh between 10 – 20 lbs (4.5 – 9.0 kg). It’s designed to provide a smooth pedaling motion and a fairly consistent momentum. It’s also bi-directional. 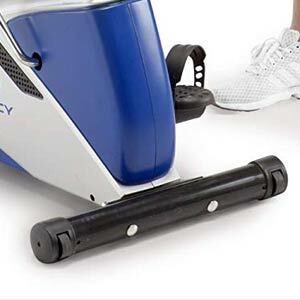 As we’ve mentioned above, this Marcy upright bike is equipped with a mechanical magnetic resistance system. This means you don’t have to connect it to a power source, nor you need any power adapter for it. Its internal magnetic brake is connected to the tension knob on the console mast. When you turn the knob, the brake moves closer or farther from the flywheel which increases or decreases the pedal resistance. Since the brake is magnetic, it does not touch the flywheel and there is no friction between the tension elements. Therefore, the wear and tear of the main resistance parts is minimal. The bike makes available 8 tension levels. The lowest level generates little resistance, great for conditioning and recovery training. The 8th level, on the other hand, provides significantly more resistance, simulating a hill climb and giving you the possibility to train on a higher level. The bike’s internal transmission uses a poly-v belt. This being said, it does not require periodic lubrication. It also provides a vibration-free and almost completely silent pedaling motion. The bike’s pedals are made of durable nylon material, with a metallic core. They have weight elements in order to turn up if you remove your feet from them. They are equipped with adjustable straps and also have a non-slip surface. 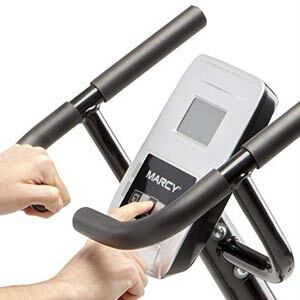 The console included with the Marcy ME-1019R exercise bike features an LCD display (without backlight) which tracks the most important workout metrics. It indicates time, distance, total distance, speed, calories, and pulse. Speed and distance are only shown in imperial units (MPH and miles); there is no option for metric units. The console unit is not telemetric. This means it can only track your pulse through the sensors integrated into the seat handlebars. It is not compatible with any HR chest strap transmitters. The console does not have any preset programs, nor it has any online capabilities. However, it does offer goal settings for time, distance, and calories. You can select a value for any of these metrics and it will begin to countdown from the selected value until it reaches zero. You can also set a pulse value between 40-240 RPM and the unit will sound an alarm when your heart rate falls below the selected value. The unit is quite easy to operate. There are three main buttons: SET, MODE, and RESET. The SET button allows you to enter setup mode and select targets for time, distance, and calories. MODE button toggles ON/OFF the unit’s scan function. The RESET button, as the term suggests, clears all the values to zero. The unit uses two 1.5V (AA) batteries which are not included. It starts up when you begin to pedal or press a button. It also has a sleep mode to which will enter if there is no activity on the bike for several minutes. The drive and resistance elements of the bike come pre-assembled and already secured by the ABS covers. Therefore, you only need to connect the two main pieces of the frame together, add the front and rear base stabilizers, the seat, the seat handlebars, the console mast, the front handlebars, the console, and the pedals. This shouldn’t take more than one hour. All the tools necessary for the assembly are included. Also, the manual provides pretty clear assembly instruction, so you shouldn’t need professional assistance. For maintenance, you only need to periodically inspect the bike for loose parts and re-tighten them if necessary. The internal parts should not need any maintenance for a long period of time. The calorie reading isn’t too accurate. The Marcy ME-1019R is a recumbent bike made for home use. It features a manual magnetic resistance system, a comfortable seat, and pulse sensors integrated into its handlebars. Its console tracks the most important workout metrics and offers goal settings for time, distance, calories, and pulse. 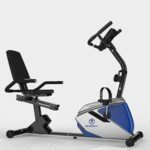 In all, this exercise bike is great for light to mid-range cardio training, muscle toning, stamina development, recovery training, and weight loss. It’s also an affordable trainer, currently available for less than $300.